It has a peculiar name, rather unremarkable appearance and humble origins but it gives its manufacturer an invaluable edge against all the big names in the auto industry: real-world experience in marketing, production, operation and servicing of a plug-in hybrid vehicle. It may end up being difficult or even frustrating experience but it puts appropriately name Chinese company BYD (which stands for “Build Your Dream”) ahead in the race to build an affordable car that can make use of the energy from the power grid, some of which is already produced from sustainable sources. Read on for more details! 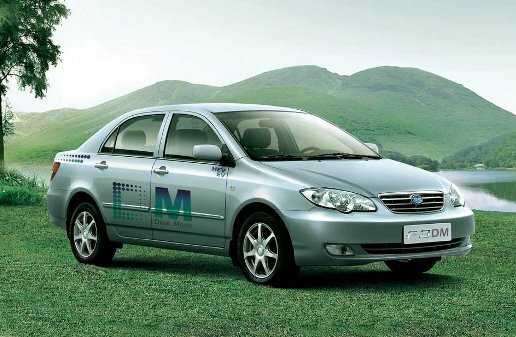 Yes, BYD F3DM does look like a previous generation Toyota Corolla and I would guess it will be a while before Chinese car manufacturers will start hiring Italian designers. The car has not been designed to impress, it has been designed to work and that’s the (inner) beauty of it! If you were looking for a plug-in hybrid car designed to impress, just lookup Volt on this blog. Well, there is an impressive side to the car: it uses a 100-unit pack of Li-ion 3.3V battery cells, exactly the kind that all the big automobile industry names always shy away from. BYD is uniquely positioned to make a good use of Li-ion batteries. The company has been established in 1995 as a battery manufacturer ans since then has become the China’s (in the electronics industry that usually means “the world’s”) leading battery manufacturer. It has branched into automobile manufacturing and is producing a line of sedans and cabrios starting with a tiny F0 to full-size F8. In this line the two models – F3 and F6 have the “DM” (dual mode) hybrid electric versions. The F6DM is said to be available later this year while F3DM has hit the (Chinese) car dealerships in December 2008. Some of the other key specs include the use of the self-designed and produced 3-cylinder 1L engine that goes by BYD371QA which is capable of generating 50kW (67hp). Surprisingly, the MPG values for the car have proved impossibly to find. I suspect that when driven beyond the 60 mile all-electric range promised by the manufacturer, the fuel economy of the can may not be too impressive but it would still be in high 40s from what I can tell. The car cannot beat Toyota Prius’s aerodynamic coefficient of 0.26 (2010 model said to have 0.25) and so the best use of the car is probably slower speeds of inner cities. Sounds like a perfect application for a Chinese car. Future will tell is the $22,000 price tag is acceptable to the Chinese car buyers but I think it would be well received here in US. Another important characteristic that has to do with the plug-in nature of this hybrid is the time to recharge its battery bank from zero to full charge: 9 hours. It should be noted that China’s electric power grid delivers 220V one-phase to a wall outlet, so converted to 110V household outlet for US sales it would have to take longer to recharge. BYD is said to be partnering with a US company called MidAmerican Energy (majority-owned subsidiary of Warren Buffet’s Berkshire Hathaway Inc.) to build fast-recharging stations in China that would be capable of recharging to 50% capacity in just 10 minutes. These recharging stations will also provide invaluable real-world experience to its operators because development of such electrical rapid-recharging stations around the world will be critical in facilitating wider acceptance of fully electrical and plug-in hybrid vehicles in the future. All in all, good job, BYD! We’ll be watching with interest the progress of F3DM sales as well a release of its large sister vehicle F6DM later this year and of course the all-electric E6 that has recently been announced. This entry was posted on Tuesday, January 13th, 2009 at 4:07 pm	and is filed under BYD China, Plug-In Hybrids. You can follow any responses to this entry through the RSS 2.0 feed. You can leave a response, or trackback from your own site. I saw these cars in auto show and they are cheapest cars ever. They just copy all other automakers since they do not obey copyrights rules. Their battery technology is very impractical for consumer use compared tho those developed already by other automakers. Number of car makers can put a plug in in production, but unlike Chinese, they they still are trying to improve technology to make it practical and worth the money/operation cost, reliable.